We have more conversations with the world’s consumers than anyone else… At the recent Milan fashion show for Dolce & Gabbana, editors of established industry bibles like Vogue found themselves relegated to the second row. Most of the young people in the sought-after seats in front of them weren’t working for major media brands or established fashion magazines. Instead, their influence comes from the number of people who are following them online. They were there because Dolce & Gabbana’s key audiences had decided they’re a more relevant source of style ideas and inspiration. Those in charge of the seating arrangements at fashion shows aren’t the only marketers who are reacting to this fundamental change in sources of influence. If brands wish to form relevant partnerships and influence the right people, then it is vital they understand how the new influencers work. And it isn’t only the younger generation who have made this switch. 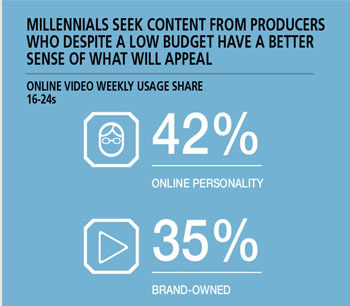 In several markets, we see a significant consumption of influencer-generated content across the generations. These new influencers include the likes of Swedish gaming blogger PewDiePie (the most watched individual on YouTube with 48 million followers) and Wang Sicong (the son of China’s richest man who boasts 21 million followers on Weibo). However, they also include many thousands of less famous influencers who may specialise in areas as niche as clean eating, hair styling, exercise or training dogs, and have established large networks of people who regularly read their content. Social media has changed the landscape of influence with the user-friendly nature of platforms like Instagram and Snapchat – they have lowered the barriers of entry in terms of producing content that looks and feels credible. Influence depends less on having expensive editorial and technical resources; it resides with those who instinctively understand what makes an audience tick. TYPES OF INFLUENCE As these individuals are social media celebrities, it’s tempting for brands to use them in traditional celebrity spokesperson roles. But this is risky because their influence stems from a different form of authority and credibility, and comes with different expectations. When YouTube fitness guru Joe Wicks appears in films for Uncle Ben’s rice, he’s offering a traditional style of endorsement. But in reading from an ad agency script, is he sacrificing the authenticity that’s so fundamental to his core appeal? And when food blogger Katie Bryson appears in TV ads for Birds Eye, is she doing the same? It’s far from clear whether the values associated with an influencer celebrity can be lent to a brand in the same way that George Clooney’s charisma is borrowed by Nespresso. Influence is less transferable when it comes not from aspiration but from an audience’s ability to identify personally with an individual. Wicks received hundreds of negative comments from followers who didn’t feel his personal values were compatible with the paper’s politics, when he recently launched a content partnership with The Sun newspaper in the UK and promoted it on Instagram and Facebook. Followers feel a strong sense of ownership where influencers are concerned. Therefore, adapting to the new type of influence isn’t merely a case of working with a new cast of characters; it requires marketers to understand a new set of rules too. The brands that succeed will be those that pay close attention to influencers’ relationships with their audiences and use such insights to tailor their own content development. RIGHT INFLUENCERS Choosing the right influencers begins with looking beyond simple follower numbers to work out who is generating the most relevant patterns of influence in the most relevant subject areas. The influencers of most value to marketers are often the most specialised to cater to smaller but more purposeful audiences that are actively seeking expertise – and are primed to act on it. Marketers need to focus on how relevant an influencer’s followers are and what they actually do with the content the influencer shares. Of particular interest is content that generates repeated sharing on the part of an influencer’s network. It is this sustained second-wave sharing and commenting that marks the most effective content on social media. Influencers are influential because they instinctively understand the emotional triggers that motivate others to become involved and amplify what they have to say. TYPES OF PARTNERS Analysing and applying those emotional triggers can increase the relevance and engagement for brand content. But greater authenticity and credibility can come from creating that content in partnership with the influencers themselves. Interestingly, one of the most successful brands in this area doesn’t tend to use celebrity influencers at all. GoPro has built its brand on YouTube and Instagram by encouraging customers to showcase their appetite for the outdoors and extreme sports, inner creativity and above all, instinct for producing content that resonates with others like them. The key to its success has been curating an environment that nurtures such grassroots influence rather than borrowing influence from elsewhere. When a brand can build a genuinely collaborative relationship with its relevant influencers, it opens up the possibility of using those influencers’ networks to spread brand content. This is the promised land of influencer-related strategies; it is a way to tap into relevant audiences that are increasingly difficult to reach through traditional media channels. It’s also the most difficult objective for those strategies to achieve. This is because influencers’ willingness to stake their own credibility depends very much on how genuinely involved they are in content creation. For example, it’s significant that Joe Wicks’ Uncle Ben’s content appears on Uncle Ben’s YouTube channel rather than his own. THE PROMISED LAND But evidence is growing that brands which focus on creative collaboration can find ways to tap into the reach that influencer networks provide. Travel vlogger Casey Neistat decided to film his upgrade experience on an Emirates flight by sharing it with his five million YouTube followers and generating over 24 million views on the platform – not because he was paid to do so, but because it was a story he knew would excite people. There are millions of potential influencers who can make a relevant contribution to marketing objectives. But this can only be achieved when their influence is understood, respected and applied in a relevant way. If marketers want help with winning friends and influencing people, they need to study those doing the influencing as carefully as those they intend to influence.